In the early 20th century many microscopists had difficulty understanding the diffraction theory of image formation in the microscope which Ernst Abbe had developed in the later years of the 19th century. To get the message across, Abbe's company, the great optics firm of Carl Zeiss, manufactured a teaching kit containing a special objective, a test slide and various 'tools'. The objective was mounted on a 'funnel' with a slit for inserting apertures or slits to modify which part of the diffraction pattern was able to contribute to the image. The Zeiss Diffraction Kit is both instructional and great fun to play with, but sadly it has now been out of production for many years. While on sabbatical at the University of Sydney, Professor James Pawley came up with the concept of making a computer simulation of the Diffraction Kit. 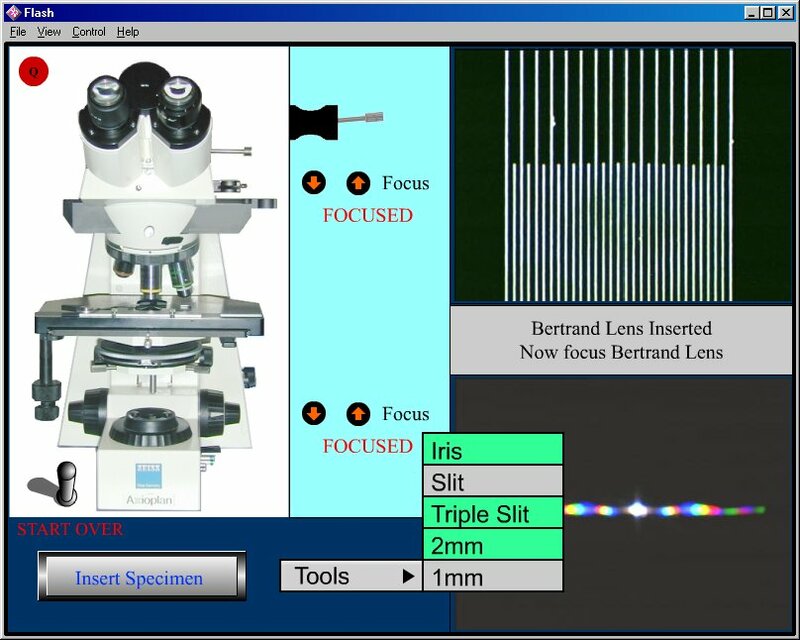 The Australian Key Centre for Microscopy and Microanalysis provided sufficient funding to develop a prototype with a limited subset of the range of tools available on the original Kit. Our objective has been to keep things as close as possible to using an actual microscope. When you focus the image, the focus knob turns; when you insert the Bertrand lens, you see the slider go in. Other controls which were not suitably located for display in this way are shown as animated icons which reflect their actual shape and operation. The image plane and back focal plane are visible all the time and show what is happening. The images are real, captured from a microscope which was fitted with an original Zeiss Diffraction Kit. We are seeking sponsorship to expand the simulation to include more tools and other patterns from the test slide. We would like Diffkit to remain a free resourcce available to educators and students worldwide. As such it would surely return value to the sponsor. Any potential sponsors are asked to contact us. The current version is available for free download. Caution - these are large downloads - around 3-4 MB. Click here to download Diffkit.swf - a platform independent Macromedia Flash file which requires the Flash player to run it. The Flash player (for PC, Mac Linux & Solaris) is a free download from Adobe. If you would prefer to get a copy on CD please contact us via the link below for the cost applicable to your country and currency.